To get into the swing of things fast, I suggest you first go to the 10:15 minute mark of the video. There, the documentary explains that in 2010 there was an earthquake in earthquake-prone Qinghai province that killed about 3,000 Tibetans and collapsed or severely damaged numerous if not all houses that Chinese engineers had built for the Tibetan provincials -- who had no say about moving into the houses on account of their ancient Tibetan-built houses were bulldozed. However, the remaining Tibetan-built houses in the province weren't affected at all by the quake. They'd been designed and built to withstand earthquakes. I won't resist adding that Chinese rulers didn't think up the idea to pry humanity away from its past. See Nils Gilman's Mandarins of the Future: Modernization Theory in Cold War America. And the Soviets had their own Cold War modernization policy; the big difference is that they modernized on a shoestring budget, whereas the U.S. could spend big money to modernize the world's underdeveloped peoples out of accepting Soviet Communism. But it was actually the French who got the modernization ball of yarn rolling. This was during the reign of Louis the Fourteenth if I rightly remember John Batchelor's book discussion about a horrific crime wave that hit Paris. The idea was to modernize a big swath of the cityscape -- replace dark, narrow and winding streets with brightly-lit boulevards laid out with mathematical straightness. This so thieves couldn't jump out at passersby and so assassins couldn't lug suitcases full of poisons through the streets of Paris without being noticed. The French eventually transferred the urban modernization project to their colonial holdings; they came to see the traditional cityscapes in those lands as a symbol of the devious Oriental Stranger. But once the whole ball of yarn is untangled we can see that French modernization theorists didn't do anything to colonized peoples that they didn't do to themselves, and their American counterparts didn't do anything to postcolonial peoples that they didn't do to themselves, and so it goes. The difference here is that Americans and the French -- and Saudi Custodians of the Two Holy Mosques, who are busy modernizing the history out of Mecca and Media -- are nowhere near as industrious as the Han Chinese. In October of this year, Roger Scruton described for readers of the American Conservative magazine How Western Urban Planning Fueled War in the Middle East. But I don't think it's the West that will bulldoze what still stands of humanity's past. If their actions in Tibet are any indication it will be the Chinese, with willing cooperation from elected and unelected governments across the world. So I really do hope that you'll visit YouTube and watch the documentary. It isn't only about what the Chinese are doing in Tibet. It's also about all of us, about our acceptance of governments whose top priority is ensuring that the masses don't get the jump on them from the cover of ancient traditions and structures. If U.S. Senator Lindsey Graham read DEBKAfile or Pundita he could have learned much earlier that the U.S. military isn't leaving Syria. The Senator, a Trump ally, has been very upset about the announced U.S. pullout from Syria, finally prompting Trump to calm him. Senator Lindsey Graham told reporters Sunday after a lunch with President Trump that plans to withdraw 2,000 U.S. troops from Syria are "slowing down in a smart way." Graham, a South Carolina Republican, said outside the White House that talks about removing military personnel from the country are in a "pause situation." The senator said Trump told him "some things I didn't know" about his plans in Syria "that make me feel a lot better about where we're headed" in the Middle Eastern country. "US Vacates First Warehouse in Syria Amid Pullout – Reports"
Now if that's not a hopeful headline from Sputnik I don't know what is, but it does seem the U.S. is making moves to draw down its troop presence in N.E.Syria, at least. However, the reports have to be read against this one, posted today at Iran's state-run FARS: Tens of US Military Trucks Arrive in Bases in Northeastern Syria. MOSCOW (Sputnik) - The United States has cleared the first military warehouse in the northeastern Syrian province of Hasakah, media reported. Sources told Turkey's state Anadolu news agency that the 4,306-square-foot warehouse on the border with Iraq was vacated on Friday. The outlet said the warehouse, which contained trucks and Hummer armored vehicles, served as a hub for distributing military aid to the Syrian Kurdish YPG militia, which Ankara sees as a terrorist group. The 50 US troops based around the warehouse had been relocated to Iraq, the publication added, in line with US President Donald Trump’s promise last week to pull all personnel from Syria. For background see China's African debt-trap: Beijing prepares to seize Kenya's port of Mombasa (Taiwan News, 12/28) and the 12/20 report from the African Stand, China to take over Kenya’s main port over unpaid huge Chinese Loan, which set off an uproar and galvanized Kenya's President to leap into executive action. Now China's SCMP is weighing in, although unfortunately China's foreign ministry wasn't able to reply to the newspaper's faxed requests for comment prior to publication time. Kenyan President Uhuru Kenyatta has strongly denied a local media report that the East African nation was at risk of having China seize the strategic port in compensation for unpaid debt related to belt and road infrastructure development projects. According to online news portal African Stand, Kenya may soon have to hand over control of its largest and most developed port, while other assets related to the inland shipment of goods from Mombasa, on the Indian Ocean coast, may also be affected. The report cited a recently completed audit by Kenya’s auditor-general which indicated China could seize the port if Kenya was unable to repay its debt. Kenyatta described the report as “propaganda” at a roundtable discussion with journalists on Friday, according to Nairobi’s ﻿The Star newspaper. “We are ahead of our payment schedule for the SGR loan and there is no cause for alarm,” he said. Kenya ranks as Africa’s third most indebted country to China for the period between 2000 to 2017, according to data from the China Africa Research Initiative. The country’s current debt to China is understood to be about US$9.8 billion, which has funded large chunks of national infrastructure, including a number of highways and the Standard Gauge Railway (SGR) which provides a high-speed connection between Mombasa and Nairobi, the country’s capital, to facilitate the import and export of goods. According to the African Stand report, “the Exim Bank of China would become a principle in the Kenya Port Authority if Kenya Railways Corporation (KRC) defaults on its obligations and the China Exim Bank exercises its power over the escrow account security”. As a condition of the initial funding deal, the Kenyan government agreed that the port of Mombasa, the nation’s most promising, would not enjoy state immunity, allowing Chinese lenders to lawfully seize it if the debt was not repaid. Global ratings agency Moody’s Investor Service warned in November of the risk that countries participating in belt and road would lose control of valuable assets if they could not repay their debts. “Countries rich in natural resources, like Angola, Zambia, and Republic of the Congo, or with strategically important infrastructure, like ports or railways such as Kenya, are most vulnerable to the risk of losing control over important assets in negotiations with Chinese creditors,” Moody’s said in a report. Despite public outrage and concerns over the Mombasa port, Kenyatta said his government would continue to borrow to develop the country. “It is not only China that is lending its money to Kenya but also Japan, France, Germany and America,” he said. China’s Foreign Ministry did not reply to faxed requests by the South China Morning Post for comment in time for publication. The “Belt and Road Initiative”, proposed by China in 2013, refers to a range of multibillion-dollar transport and power projects that Beijing has used to assert its influence in Asia, Africa and beyond. China has funded many infrastructure projects in Africa, including the railway connecting Ethiopia and Djibouti, the Mombasa-Nairobi SGR in Kenya and the Maputo-Katembe cross-sea bridge in Mozambique. However, despite Chinese President Xi Jinping saying the initiative was “an open and inclusive process, and not about creating exclusive circles or a China club”, the belt and road project has been criticised by many as a tool used by Beijing to encourage dependence on China. In July 2017 Sri Lanka agreed to lease the Hambantota Port to China Merchant Port Holdings for 99 years for US$1.4 billion to settle unpaid debts to China. The port, which was built with Chinese money borrowed by Sri Lanka, is now in Chinese hands. Warming of Earth's surface: Is there a thermal engineer in the house? How much heat is transferred to the ground from human-built structures including artificial landscapes such as cities? Another way to put the question is to ask what the estimated difference is between the amount of heat generated by the Earth's surface on its own and the amount transferred to the ground by human-built structures. The south-north food flow has created willing foreign markets for African farmers, while home-grown goods aren’t getting to other Africans who are surviving on international relief aid flown in during food shortages. Given that this system is now in effect across all heavily populated human societies it's worse than nonsensical. Europe and other regions of the world have been staving off the inevitable consequences of over-urbanization and wasteful farming practices in their own lands by using water and arable land from other regions to feed themselves. And they're doing this without facing the fact that the regions they're using as food suppliers are just as wasteful in their farming practices and fast becoming just as urbanized. Small-scale farmers, who comprise most of the world's farmers, have to produce enough on their farms to be able to afford to buy enough food to feed themselves and their families. If you tell me I'm describing a crazy situation -- it sounds crazy only because I've clearly articulated it. But that's not how it's described by economists, governments, politicians, professors, or the news media. Instead, they speak of income from farming, they speak of the need to increase food exports and the need for more jobs in countries that need to be able to afford to import more food. So let people eat jobs. Doesn't sound nutritious? Then let us update our thinking by first recognizing that the nations that can't feed their own people are always at the mercy of events they can't hope to control. From that viewpoint, much of what we've called 'development' during the past century is actually a regression. We've been pedaling backward at a furious pace and calling this modernization. "Kenya appears to be lining up behind Zambia, which is slated to lose its international airport, as well as its national electricity grid, because of defaults on Chinese loans." TAIPEI (Taiwan News) – China may be preparing to seize some major assets in the African nation of Kenya, as a result of debt-trap diplomacy. Local media began to express concern that Chinese lenders may be angling to seize assets since it does not appear the Kenyan government will be capable of repaying the loans. Now, one month later, ahead of the New Year, it’s been reported that the Chinese may be preparing to take over the Mombasa Port infrastructure soon. With a reported loss of KES 10 billion (US$98 million) in its first year of operation, it would be nearly impossible to repay the loans taken for its construction in the time requested. Kenya reportedly accepted loans of KES 500 billion (US$4.9 billion) for the SGR’s construction. Kenya’s Auditor General reportedly stated that deal has always favored the China Exim Bank, which advanced the loan for the project. Further, Kenya signed on to a deal that requires any arbitration of disputes related to the debt must take place in China. An audit completed last month indicates that Kenya Ports Authority’s (KPA) assets, which include the Mombasa port, could be taken over if the SGR does not generate enough cash to pay off the debts. When the Chinese lender granted the loan to the Kenyan government, somehow the KPA signed on as a borrower. Somehow Kenya's government agreed that the port “would not be protected by sovereign immunity since the Government waived the immunity on the Kenya Ports Assets" by virtue of KPA signing on as a borrower, according to the Auditor General. It is becoming increasingly clear that China’s designs on the nations of Africa are anything but benevolent. Kenya appears to be lining up behind Zambia, which is slated to lose its international airport, as well as its national electricity grid because of defaults on Chinese loans. African nations must wake up to China’s new form of colonialism, which is chipping away at their critical infrastructure one major asset at a time. Earth calling Duncan DeAeth: The Chinese never held a gun to any African official's head. Now if only the Washington Post and New York Times would fall to the curse. Elijah J. Magnier was the first to predict the return of Assad to the rest of the Arab nations' fold, and did so several months ago; here is his latest on the situation, "BURYING THE AXE OF WAR: THE ARABS WILL RECOGNISE ASSAD, AND ARAB INVESTMENT WILL HELP REBUILD SYRIA," which he posted on December 19. But it's nice to see a British newspaper catching up. Wait a minute, I might have been the first to make the prediction. 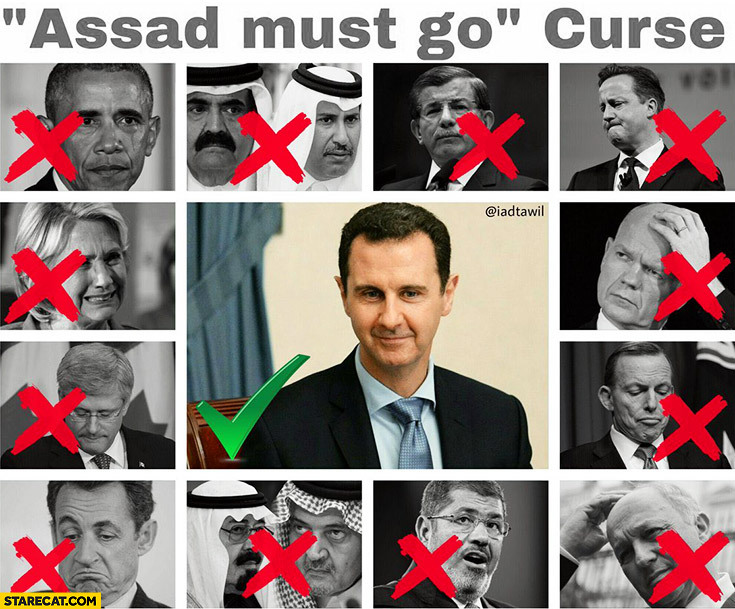 Did I not write more than a year ago that soon they'd all be making up with Assad and kissing each other on the cheeks? Nevermind; Magnier relied on his sources. I relied on human nature. However, as it has become increasingly clear that Assad is likely to stay in power and prevail over downtrodden rebel forces, Syria’s Arab neighbours have begun moving to restore diplomatic ties with the former pariah. The UAE said it was keen to “restore relations between the two brotherly countries to their normal course” and wanted to enhance “the Arab role” in supporting Syria’s independence and sovereignty. The UAE helped finance some anti-Assad rebels in the early stages of the war but played a smaller role than Qatar, Saudi Arabia or Turkey. Much of the Gulf funding for rebel groups has now dried up. Jalel Harchaoui, a lecturer in geopolitics at Versailles University, said both the UAE and Egypt had grown skeptical about overthrowing Assad because they saw him as a bulwark against their shared Islamist enemies. “As Assad’s survival in Damascus is now an indisputable fact of life, and as the West’s 2012 bet appears as a miserable failure, the ideological stance of the UAE and Egypt is being largely vindicated. Both states will now lead the campaign in having the rest of the Arab world embrace that reality,” he said. Omar Bashir, the president of Sudan, this month became the first Arab leader to travel to Damascus since 2011. His visit was hailed by regime media as a sign that Syria was being welcomed back in from the cold. “The UAE expressed its wish that peace, security, and stability would prevail throughout Syria,” the foreign ministry said. Are these volcanoes talking to each other, or what? 12/18: "Signs that Mount Vesuvius coming back to life"
Recent research shows that “medium scale” eruptions of volcanoes like Vesuvius occur once every four to five centuries. Vesuvius’ most recent medium-scale eruption occurred in 1631 and destroyed a large part of the area around the volcano, leaving thousands dead. 12/24: "Mount Etna Just Started Erupting From A New Fissure"
12/27: "Mount Etna volcano triggers 4.8-magnitude earthquake in Sicily"
An overnight earthquake, triggered by Mount Etna's eruption two days ago, caused injuries and damage in Eastern Sicily early Wednesday morning. The volcano has been spewing ash, and lava has flowed down its slopes since it began erupting on Monday. ... Officials said the quake was one of about 1,000 tremors, most of them small, related to Etna's eruption. "Tremors during eruptions are pretty normal here," Gaetano Maenza told the press. "What is unusual is the level of magnitude triggered by Etna. I have no memory of such intensity. It was scary." 12/26: "Indonesia tsunami: fresh alert for Anak Krakatau volcano as eruptions continue"
Indonesia has raised the danger alert level for the volcano that sparked the devastating Sunda Strait tsunami, adding to a previous warning that fresh activity at the crater threatened to trigger another deadly wave. 12/27: "Satellite images show collapse of Indonesian island volcano"
JAKARTA, Indonesia (AP) — Radar data from satellites, converted into images, shows Indonesia’s Anak Krakatau island volcano is dramatically smaller following a weekend eruption that triggered a deadly tsunami. Takeaway? Humanity shares its existence with a planet that has its own life cycles and problems to deal with. So when push comes to shove, it's humans that have to make adjustments, not Earth. Now what would happen if a Grand Solar Minimum is in the works? Well much cooler weather in many parts of the world. But if it came on top of a major volcano eruption, the kind that generates so much ash that it cools the planet, this is what's known as a problem. A real problem, not the stuff that clutters the news every day. We'll just have to see. Meanwhile, we should be making hay while the sun shines. That means dealing with our own biggest problems, which have nothing to do with conflicts between regional peoples that have been going on for decades if not centuries. Israeli missiles almost shot down 2 passenger planes in Syrian airspace. Way to go, Israeli Air Force. I have bigger fish to fry than talking about Bibi Netanyahu's temper tantrum at Donald Trump. But really, risking scores of civilian lives on Christmas? Yes I know the Orthdox Christmas isn't until January 6 but December 25 is also the date Christmas is celebrated, and the Israelis well know this. The Israelis have to stop staging provocations in Syria and they can ditch the yammer about Hezbollah's tunnels. If the IDF is so upset about the tunnels, take their army and invade Lebanon, but stop trying to drag the United States into a war against Lebanon -- or Iran, for that matter. Fight your own battles and keep Americans out of it -- all of it. US military sources disclose that the Israeli air offensive on Tuesday night, Dec. 25, was conducted by IAF F-16I fighter jets firing Delilah cruise missiles from Lebanese air space into Syria. Damascus is said to have countered the attack with Russian Pantsir-S2 and S-200 SAM air defense weapons. These highly credible sources also disclose that the Israeli attack was aimed at Syrian military sites – not Iranian and Hizballah targets as earlier reported in Israel and Damascus. The Israeli government and military chiefs had apparently decided, say the US sources, to take advantage of the chaos generated by President Donald Trump’s decision to pull US troops out of Syria and Ankara’s threat of a Turkish army thrust across the Euphrates. Their purpose was to disable Syrian military sites where Iranian and Hizballah combat assets were quartered. After the F-16 jets failed to connect to their targets, the IDF sent the F-35 stealth planes over in a second wave. The report continues in great detail but doesn't mention that Netanyahu is very upset that Trump shut him out of discussions about a vaunted drawndown of American troops in Syria prior to announcing the decision. The only national leaders he discussed it with prior to the announcement were Putin and Erdogan, although he gave Netanyahu a five minute head's up about his decision before tweeting his announcement. US troops will leave eastern and northern Syria, but America is not deserting this part of the country, said the officials, without revealing the nature of its continuing presence. The Trump administration has not abandoned the Kurds or “stabbed them in the back” as widely reported, “and the Kurds know this,” it was authoritatively said. And, indeed, despite their loud cries of dismay, not a single Syrian Kurdish militiaman has deserted the lines they hold against ISIS in eastern Syria. Part of the ISOF’s deployment will include the western Iraqi province of Anbar. In this regard, the US officials referred to a disclosure by Mohammad al-Dilemi, one of the chiefs of Anbar’s Arab tribes. On Dec. 12, he said that the US army was building a new base on the line dividing Anbar from the next-door province of Nineveh. It would position US troops 30km north of the Euphrates River and near the Syrian border. This new base will provide the Iraqi division with American backup. The officials from Washington refused to confirm or deny that the Russians were involved in the forthcoming US plans for Syria; nor would they refer to a possible US-Turkish-Russian deal on the subject. They did take note of the strides taken in recent weeks toward repairing Russian-Israeli relations. The US officials pointed out that the transfer of a Russian S-300 air defense missile battalion to Deir ez-Zour in eastern Syria brought the Israeli Golan and Galilee Panhandle within their range, but not the Israel Air Force bases in northern and central Israel. ... In September, however, the administration switched course, saying the troops will stay in Syria pending an overall settlement to the Syrian war and with a new mission: to act as a bulwark against Iran’s expanding influence. The Pentagon does not say how many troops are there. Officially, they number 503, but earlier this year an official let slip that the true number may be closer to 4,000. Most are Special Operations forces, and their footprint is light. Their vehicles and convoys rumble by from time to time along the empty desert roads, but it is rare to see U.S. soldiers in towns and cities. So even if the U.S. withdraws 2,000 troops (or 2,600 according to one news report), this still leaves a a sizeable contingent in Syria. Which, again, the Israelis know. [shaking her head] Kindergartners with missiles. But were they actual Black Swan events? A completely unpredictable disaster is more an abstraction than an actuality. There are usually some people who have enough intelligence, knowledge, and experience to predict events that others can't. But a Black Swan event is a highly improbable one. So generally it's an extraordinary or unprecedented convergence of factors that turn a surprise disaster into one so improbable it's almost impossible to predict. Such was the case with the tsunami that struck Indonesia on December 22 and the wildfire that struck the town of Paradise in Northern California on November 8, and which became the deadliest and most destructive wildfire in California's recorded history. In both disasters the basic threat situations -- one a tsunami, the other a wildfire -- were predictable, and so were the individual factors in the incidents. But all the factors coming together at the same time? Nah; improbable to the point of virtually impossible. So what is the meta-message, if any, to be gleaned from two improbable mass-casualty disasters happening close in time to each other but separated by vast distances and vastly different circumstances? This is a very important question to people such as myself, who are always on the lookout for Signs & Portents. After pondering the question for several hours I'll say this to Pundita readers. I think we're heading into a time when it's particularly important to work at making it habitual to become highly aware of one's surroundings. Not an easy task; the more settled one's life, the easier it is to take one's surroundings for granted. But if you pretend that you're a professional bodyguard hired to look after yourself and your family, and look at situations you enter from that angle, you'll start seeing things, risks, that you wouldn't ordinarily notice. Here I'm reminded of a scene in the 1992 film "The Bodyguard" when bodyguard Frank Farmer has accompanied his client, Rachel Marron, into a clothing boutique. At one point she's in the dressing room and asks him to grab a particular dress from the clothes rack and hand it to her. He replies, "I'm here to keep you alive, not help you shop." As with Rachel, who was darned if she was going to alter her daily routines just because of some stalker, we don't want to listen to the little voice at the back of our mind when we're having a good time or have someplace we need to get to. But if the goal is to live long in your present body, which is how to acquire wisdom that by the way you do take with you in your next appearance in this realm, it can pay off big-time to train yourself to listen more carefully to your instinct. It's been noted repeatedly in news reports that there was no warning of the tsunami. True, from all I've read of the reports. But there was something strange, which I didn't know about until just before I posted my last write-up on the disaster. The volcano suddenly stopped spewing not long before the tsunami struck. The strange part was that after it went silent, some kind of dark cloud enveloped the entire volcano, completely blotting out the view of it from the moonlit shore of the Sunda Strait. And don't spend time wondering, 'Now what could that dark cloud mean?' Again, we're not trying for omniscience, just to stay a few seconds ahead of anything ranging from a serious problem to a mass-casualty event. Clear? Practice. Like getting better at anything else -- it takes practice. Practice situational awareness and listening more to the voice at the back of all the chatter in your mind. Practice. The big surprise for me in the following AP report was the large reach of the tsunami; early reports had suggested, at least to me, that the impact was pretty much confined to one shoreline area, in Sumur, but that turned out not to be the case; the tsunami was also hitting shores that were "hours away" from Sumur. So I think we can assume the death toll, which has spiked in the past 24 hours to 429, will rise even higher as authorities get into all the affected areas -- a slow-going operation once they procure enough heavy equipment for removing debris blocking roads. Regarding the height of the waves, which had generally been cited as between about a half a meter to two meters, some survivors swore that they were at least 3 meters high; from this short video that AP took of damage in one area, it looks to my eyes as if they were right. That's a lot of water displacement from a chunk or chunks of volcano wall splashing into the sea. But the displacement happened so fast, and so near to shore, it was only 24 minutes until the waves hit shore. I'll also mention from an earlier report I posted that there wasn't one big wave -- it was a series of four waves, according to a Red Cross/Red Crescent volunteer. The most unsettling part is that the sea gave no warning -- no sudden receding of waters to indicate a tsunami was on the way, as happens when one is caused by an earthquake. As to whether the change in color of the sea might have given some warning, well, the video of that strange whitish color was taken on the morning after the tsunami hit. So we don't know how long it was before the sea color reflected gunk or "steam-rich magma/lava-water interaction" from the flaming, disintegrating volcano chunk(s). But one survivor told AP that there was nothing strange about the sea before the tsunami hit -- it was just a full moon shining on calm waters. Did the moonlight mask a sudden chalkiness of the water's color? Don't know but even so, I'm not sure that even volcanologists would have immediately put two and two together: 'Oh look, the sea's turned white; run for your lives.' I don't think so. But now they would know -- provided the Indonesian news media has picked up on that video footage. If not for the eagle eye of a Sputnik editor scouring Twitterf, I wouldn't have known about the footage. In any case, residents and tourists near the volcano sure enough need to stay away from shore until that force of nature settles down. Barring that, be fit enough to run inland very fast on hearing the first scream. As to whether you could hope to out-drive the wave -- read one survivor's experience with that attempt, as she told it to the AP reporter. I guess it's a judgment call but the seconds you take to get into the car can mean the difference between life and death. And again, this wasn't one wave; if you thought you were okay after the first one passed, there were more on the way. In addition, it's not necessarily the inbound wave that's the worst, it can be the sucking motion as the wave recedes. One man couldn't get over the power of the outbound wave; as he clung to a post for dear life while a wave pulled toward the sea he thought, "So this is a tsunami?" Guess so. 1. 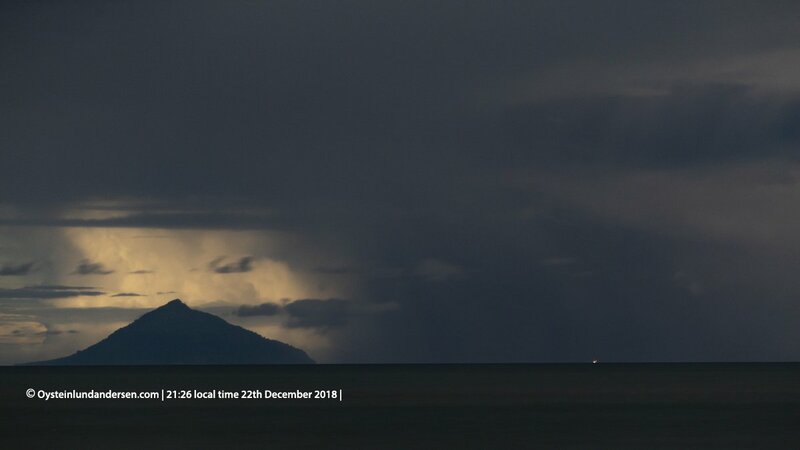 #Krakatau volcano: First of these photos, taken at 19:12 local [Indonesia] time yesterday, shows the volcano erupting lava continuously. Second photo, taken at 21:26 local time -- only minutes before the #Tsunami went ashore in front of me in West Java. 2. 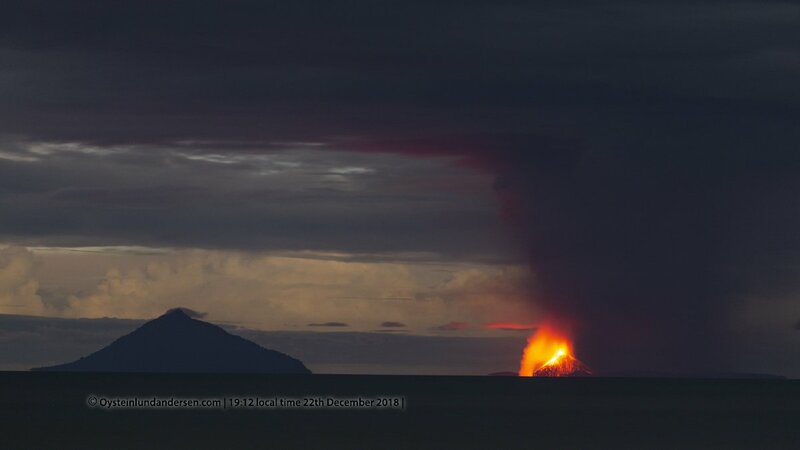 I remember being surprised that activity had totally ceased, and Anak-krakatau wasn't even visible at all. No eruption sounds were heard. Then a few minutes passed, and the Tsunami arrived. What obscured the suddenly banked volcano? Looks like it could be smoke, dust. Had big chunks of the mountain fallen inside the volcano, smothering the fireworks, while the rest of the chunks slid into the sea? No idea, but the point is that all seemed quiet with that volcano. Then -- BAM! Shock waves hitting shore. SUMUR, Indonesia (AP) Panicked residents, police and soldiers in this remote fishing village clobbered by a devastating weekend tsunami ran to higher ground Tuesday, shouting “Water is coming! Water is coming!” and reciting verses from the Quran as emergency messages were broadcast over mosque speakers. It proved to be a false alarm, but a similar frenzy broke out in Tanjung Lesung, another tsunami-stricken area located hours away, as survivors of the disaster remained traumatized by a tragedy that killed more than 420 people and left thousands homeless. Military troops, government personnel, and volunteers continued searching along debris-strewn beaches. Yellow, orange and black body bags were laid out where victims were found, and weeping relatives identified the dead. Many searched for missing loved ones at hospital morgues. Wiwat Salyakamthorn, aka Ajarn Yak, made his name over the decades preaching to farmers the sufficiency philosophy conceived and developed by the late King Bhumibol Adulyadej [Rama IX] to sustain Thailand's agricultural sector. Mr Wiwat, who comes from a farming family in Chachoengsao province, has worked at the Office of the Royal Development Projects Board for 16 years, advising farmers on how to practise self-reliance. Examples include using eco-friendly homemade fertilisers and growing mixed crops to manage risks from unpredictable weather. But only a few farmers listened to what he talked about, with some even snubbing him with a sarcastic remark that he could say whatever he wanted because he worked at the Office of the Royal Development Projects Board. What Mr Wiwat finally did in response to the question is an interesting and instructive story.